The new moon of April 7, 2016 11:24 UTC, is the closest new moon of the year. When you see the sun on April 7, think of the moon, too. It’ll be between us and the sun – but not exactly between – crossing the sky with the sun throughout the day. It is good time to commit to personal goals that express the positive energies. It’s time to take action – try something new and innovative, and go at it with gusto and confidence; be assertive without being abrasive; take charge of our lives; start a brand new project; and discover our own personal courage. A new moon symbolizes new beginnings when you look at old goals and set new ones. It is a good time to contemplate upon your life. The meaning of a new moon is the opportunity to start anew and refresh your dreams and desires. It is a time of magic! Did you set New Year’s Resolutions that may need a little boost to them by now? Have any of your goals gone from bright to dim? Now is the time to support them with the new moon energy and its significance and symbolism. To make this a sacred time use Four Items to honor the elements. Have with you a small bottle of sand for the element of earth, a feather for the element of air, a red candle for the element of fire, and a cup of water for the element of water. Drink some of the water in your glass and allow the energy to infuse all parts of your inner self, knowing that you raising your vibration to a higher level. You can do this again on the next new moon. Book Your New Moon Reading Now! There’s no time like the present. 😉 Where are you currently on your path? A New Moon occurs on Friday, June 27th, 2014, at 4:08 AM EDT marking the beginning of a new cycle. The Gemini New Moon cycle ends and the Cancer New Moon cycle begins. The above picture has an awesome prayer to say out loud on the first night of a new moon. It sets your intentions to a new vibration. A new moon symbolizes new beginnings when you look at old goals and set new ones. It is a good time to contemplate upon your life. The meaning of a new moon is the opportunity to start anew and refresh your dreams and desires. It is a time of magic! Did you set New Year’s Resolutions that may need a little boost to them by now? Have any of your goals gone from bright to dim? Now is the time to support them with the new moon energy and its significance and symbolism. New Moon Magic: Make a fresh start, begin a project, initiate a new relationship, start a new routine. Create a ritual: Set an intention, write down your wishes, dreams, and desires. Light a white/silver candle; imagine the new moving toward you in joyful, powerful ways. Spend a few moments breathing in the energy of this new reality each day, making it more and more tangible. Work this for one moon cycle and re-access and energize on the next new moon if needed. Let this new moon help you make a difference in your life and in your part of the world. Blessings of the Maiden Moon to you! Watermelon is a delicious summer fruit that has become a staple at family picnics and cookouts. Did you know that watermelons are 92% water? No wonder they’re so refreshing! Watermelons are packed full of minerals that are essential for the body during the hot summer months. Watermelons have an abundance of fiber and our excellent for intestinal regulation. There are around 300 different kinds of watermelon in the U.S. and Mexico. You can find red, pink, white, and yellow varieties in various sizes and shapes. Watermelons are usually quite large, and many county fairs award prizes for the biggest ones. According to the Guinness Book of World Records, the heaviest watermelon weighed 262 pounds. 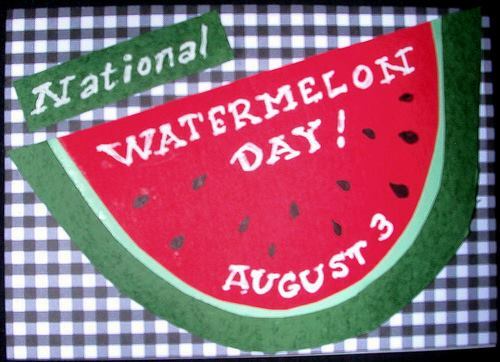 To celebrate National Watermelon Day, have some watermelon for dessert tonight! Slice it up and eat it plain, juice it, cook it on the grill, mix it into a salsa, or blend it into a cocktail. Above all Enjoy! Message From Mother Earth: Don’t Frack Me! Until a few months ago I had never heard of Fracking, but thanks to Yoko Ono, who I follow on Facebook, I was made aware of what Fracking is all about. This is another harmful invasion to mother earth and her inhabitants. Yoko Ono is making this quite public and with her influence she is bringing awareness to the world about the dangers of Fracking and fighting to stop further Fracking. Fracking is short for hydraulic fracturing. It’s an extremely water-intensive process where millions of gallons of fluid – typically a mix of water, sand, and chemicals, including ones known to cause cancer – are injected underground at high pressure to fracture the rock surrounding an oil or gas well. This fracking releases extra oil and/or gas from the rock, so it can flow into the well. But the process of fracking introduces additional industrial activity into communities beyond the well. Clearing land to build new access roads and new well sites, drilling and encasing the well, fracking the well and generating the waste, trucking in heavy equipment and materials and trucking out the vast amounts of toxic waste — all of these steps contribute to air and water pollution risks and devaluation of land that is turning our communities into sacrifice zones. Fracking threatens the air we breathe, the water we drink, the communities we love and the climate on which we all depend. That’s why over 250 communities in the U.S. have passed resolutions to stop fracking, and why Vermont, France and Bulgaria have stopped it. I have noticed that when vibrations within and around us speed up (and this can be sensed by anyone willing to), time is no longer able to act as a buffer between events that happen to us on earth and our responses to them. When vibrations slow down, the span that exists between the experiencer and thought widens and lengthens. Thus, the slower the speed of vibration, the greater the distance and the longer the timing between the events that happen to us and our response, in other words time moves slowly along, there’s plenty to spare, we have all the time in the world. You may be scratching your head going what does this all mean, but if you can quiet your mind and think on all of the words here it will start to make sense to you. You will not be the person standing in a line, hoping the Government will help you. •	A child’s bag should contain some toys, crayons, and paper. •	Minimum 3 Day supply of Food & Water (5 year shelf life) I recommend a five day supply, per person.